Pope Francis completed his two-day visit to the United Arab Emirates by celebrating an historic public Mass in Abu Dhabi.The Mass marked the end of a visit remarkable in its frequent affirmation of fraternity between Christianity and Islam. 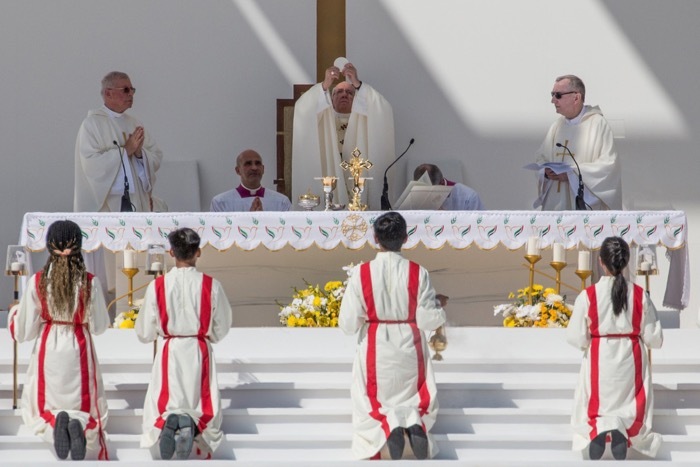 The Pope led the largest act of Christian worship at the Zayed Sports City Stadium for an estimated 120,000 with many participating in the ceremony by watching the celebration outside on big screens. Francis arrived at the stadium to a rapturous welcome with people waving Vatican flags and cheering “Pope Francis” as he circulated the crowd in his Popemobile before processing to the specially constructed white altar. The 82-year-old Argentinian Pope is the first Roman Pontiff to visit the Gulf peninsula and celebrate an open-air Mass in a region that gave birth to Islam. During the liturgy, which was celebrated in English, Italian and Arabic, the Pope told the Catholic community to reject worldly logic. The popular thinking, he said, is that it is the "rich and the powerful who are blessed” but for Christians it is the wealthy “in love” such as “the poor, the meek, those who remain just even at the cost of appearing in a bad light, those who are persecuted”. The Mass on Tuesday 5 February was attended by around 4,000 Muslims and the Crown Prince of Abu Dhabi, Sheikh Mohammed bin Zayed Al Nahyan, who heard the Gospel passage of the beatitudes from Matthew 5:1-12. “Let us look at how Jesus lived: poor in respect to things, but wealthy in love; he healed so many lives, but did not spare his own,” Francis said in a homily delivered in Italian and simultaneously translated into Arabic. “Meekness is important: if we live in the world according to the ways of God, we will become channels of his presence; otherwise, we will not bear fruit,” he explained. The Catholic population in the Emirates totals just under 1 million people, largely made up of migrants from the Philippines and south India. Catholics are served by 68 priests, nine parishes and led by Bishop Paul Hinder, the Apostolic Vicar of Southern Arabia. The Beatitudes, the Pope told them, should be a “roadmap for our life”. He praised the local Emirates church for being an example of living them out. He likened them to the church of Philadelphia found in the Book of Revelation, which was found to be above reproach and persevered in faith. “I have also come to say thank you for the way in which you live the Gospel we heard,” the Pope said. Before the Mass, the Pope met with Bishop Paul Hinder, Apostolic Vicar of Southern Arabia and local priests before paying a short visit to St Joseph’s Cathedral, Abu Dhabi, where he met members of the local Catholic community. Following his address, the Pope and Dr Ahmed el-Tayeb jointly signed a declarationcondemning religiously-inspired violence and committing followers of Christianity and Islam to dialogue and peace-building. “Muslims of the East and West, together with the Catholic Church and the Catholics of the East and Wet, declare the adoption of a culture of dialogue as the path; mutual cooperation as the code of conduct; reciprocal understanding as the method and standard,” the document, “Human Fraternity: for world peace and living together”, stated. The declaration calls for “full citizenship” to be given to Christians and Muslims wherever they live. Following the public Mass in Abu Dhabi the Pope departed the stadium and headed to the airport in Abu Dhabi to board the return flight to Rome.